We are living in a digital era where everyone is surrounded by the technology. Even the children now a days are smart enough that they dont like the ordinary toys but digital gadgets. If we specifically talk about the education, many schools have upgraded themselves to digital screens, tablets and multimedia approach. However, our religious institutes are lacking behind this is the reason that children do not show interest in religious education. Offering Prayer, (Salat) is an obligation on every Muslim but it is very unfortunate that our youth is not aware of its rituals and method that how to offer the prayer. 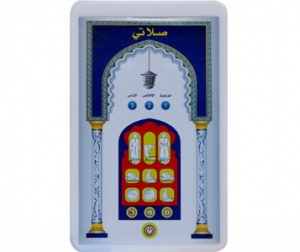 Keeping in mind the aforesaid situation, Darussalam Publishers brings you, Salatee (My Prayer) device. After this device you dont need to teach our children the method of prayer. They will themselves learn the process of prayer in a fun learning method. This device looks like a tablet or an iPad with touch feature. It has step by step pictorial guide and each image is an interactive button which is when pressed, plays the sound that particular step. It is very light in weight and easy to carry device for your children. Its crystal clear sound and smart design makes it more dearer to the children to learn religious affairs while being smart. Product is good for childrens.